On the right we find the car of Pennsylvania's Dave Strickler. 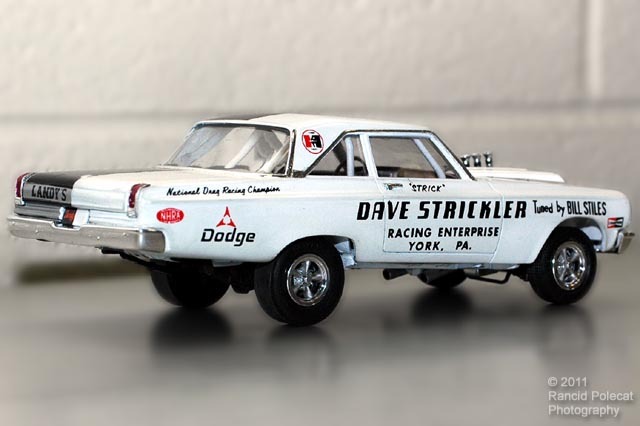 Strickler won about 80 percent of his races in this car. Like the Landy car, Strickler's car carries equipment typical for its day: multiple-leaf rear springs with a pinion snubber to control wrap-up, a simple roll cage, M&H Racemaster slicks, and American magnesium wheels. Ron built both cars starting with two Polar Lights Coronet bodies to create the altered wheel base. He moved the front axle forward ten scale inches and the rear axle 15 scale inches. After fabricating a tubbed race interior, he sprayed the two paint schemes.